The route of the Bear in 1900 (not the red line, the thin black line). Source: U.S. Coast Guard Historian’s Office. The houses, some forty in number, are scattered without regard to order, wherever they can be made to hang on the almost vertical face of the cliff; the lower houses being more than one hundred feet above the water, from which level they rise in irregular tiers or terraces one above the other, the floor of one house frequently forming the roof of the one below. The houses are so constructed and set on top of one another as almost to suggest one large communal dwelling, having perhaps a far-fetched resemblance to the cliff dwellings of Arizona and New Mexico, differing vastly, however, in material and mode of construction. The summer houses are square boxes of walrus skin stretched on frames of drift-wood, lashed together and guyed to the rocks with thongs, no nails, screws or other civilized methods of joining being used. These houses are usually entered from a platform of drift-wood on the side facing the sea, and the circular opening which is used for a door serves also for a window, admitting light and, when the weather is not too cold, air. 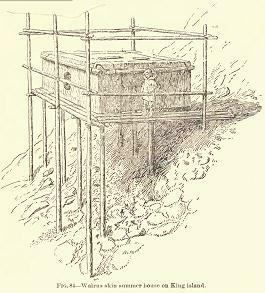 For winter dwellings, caves in the rock, rudely but skillfully walled with loose fragments of stone, are used; some of the winter houses being reached by a tunnel several yards in length, after the fashion of neighboring Eskimo on the mainland. As in most Eskimo villages, there is one house larger than the rest, known as the Kashime, which answers the purpose of a public house or club, and its hospitality is impartially shared by the entire community. It is often the home of the young unmarried men, and the place of entertainment for strangers. It is also the place of general gatherings, where the long Arctic night is enlivened by the shouts and laughter of the half-naked dancers and the rude, monotonous music of the tom-tom. Here the gossips meet, here the Shaman performs his tricks of magic, and the hunters of bear and walrus relate their deeds of daring on sea and ice floe. Inside the ordinary dwelling a low bench extends around two or three sides of the single room which serves by day as a seat and by night as a bed. The room is usually about twelve or fifteen feet square, and in this single apartment a whole family, and sometimes two or three families, spend their entire indoor life. The University of Washington has some photos of King Island in 1899 in its digital photo collection. Here's a photo from the water and here's another with a close up of the houses. There were probably more than one of the "public houses," or men's clubs in King Island. The household equipment is of the simplest and rudest description; a few wooden vessels and a curiously-fashioned stone lamp comprise the entire culinary outfit. This lamp, fed with seal oil, emits more ill-smelling smoke than light or heat, and serves all the purposes of a stove, but most of the food is eaten raw, or nearly so. Seal oil and walrus meat, and at certain seasons sea fowl, with an occasional dinner of tom cod or other fish, boiled or dried and eaten raw, form the almost unvarying diet of the King Islander. Of vegetables they know nothing from one end of their lives to the other. Tea and tobacco, their only luxuries, are shared impartially by all ages and both sexes. …fire arms are possessed by a few, but seal and walrus are yet hunted with the spear, and making spears and other weapons with flint heads and ivory points is not yet a lost art. Birds are killed with slings, and fish are taken with whalebone lines and curiously wrought hooks of stone and ivory. Spear heads are now found in use among them, flaked from broken glass, fragments of bottles, and fashioned like those of flint, once so common among savage races. The only western products or tools he mentions are tea, tobacco, fire-arms, and the use of broken bottle glass for making spears. If Hawley is right, why didn’t the King Islanders make more use of western tools? Ignorance seems unlikely: they had been in indirect contact with the west through regional trading networks since the 17th century, Russian and Yankee traders had operated in the region for some time (I posted on 1819-20 visits by American traders here), since 1848 American whalers had been swarming through the region, and a gold rush in recent years had produced a large western community at nearby Nome. Cultural conservativism also seems unlikely to me. Northern peoples seem to have been responsive to price changes, or changes in the available technologies (Sled dogs to Snowmobiles). The King Island stilt houses also show an imaginative application of the regional umiak making techniques: the the living quarters themselves were made from walrus skins stretched over wooden frames - like the umiaks. Either limited cash or trading resources prevented them from buying the new tools, or, as I think more likely, up to this point, they had found that their own methods were more efficient. Sometimes the island has been swept by epidemics which have threatened extinction of the tribe; as in the summer of 1900 when disease carried off at least a third of the entire population. The previous winter had been a hard one, and the passing of the ice had found the people weakened by hunger and unable to take advantage of the spring hunting season; few seal or walrus were taken, and a whaler visiting the island to trade had left the disease, which spread rapidly and disastrously, as it always does in the fertile soil of a primitive race. When the United States revenue cutter Bear visited the island on the 2nd of July, 1900, many had died and nearly all were sick, but little could be done except to give them the food so much needed. On the second visit of the Bear in August the island was found entirely deserted by the natives. Lean dogs wailed dismally from the rocks as our boat approached. Not a live human being was to be found, but the trail of the pestilence was everywhere visible. In the spring and summer of 1900 Natives in western Alaska were pounded by outbreaks of both measles and influenza. It’s possible that a quarter of the Native population may have died. The "Great Sickness" in the title is the Eskimo's name for the epidemics. Non-natives were hardly affected. (Wolfe) Hawley attributes the King Island disaster to the attack of an unspecified disease, brought by outsiders, on a hunger-weakened population. Haycox says that the first reports of the influenza came in the late spring; measles appeared on St. Lawrence Island in June. Hawley saw the King Islanders on the island in early July. he came back in August, but the island was abandoned. This was probably the normal summer migration to the mainland, which normally took place in in late June or early July (King Island Commute). In August he may have been able to make an inference about additional deaths after he left and before the July migration. That's not clear, but in any event, those deaths presumably took place in the four to six week period from early June to mid-July. Population estimates for King Island are poor, but Ellanna reports an estimate of 200 from 1890. Say it was about 200; a third of this, something on the order of 65 persons, died in just a few weeks in this remote and isolated community. June would have been walrus season and the scale of the medical emergency must have seriously interfered with this important harvest. The apparent scale of the disaster is startling. Despite Hawley's prediction, while King Islanders now live on the mainland and only make visits to the island, the are still, today, a distinct community. The three citations were: Ellanna, Linda J. Bering Strait Insular Eskimo: A Diachronic Study of Economy and Population Structure. Alaska Department of Fish and Game Technical Paper No. 77. May 1983. and Haycox, Stephen. Alaska. An American Colony. University of Washington Press. Seattle, 2002. Wolfe, Robert J. Alaska's Great Sickness, 1900: An Epidemic of Measles and Influenza in a Virgin Soil Population. Proceedings of the American Philisophical Society. 126(2): 91-121. April 8, 1982. Edits: July 25 - added sentences on cultural conservatism. Also added that "Great Sickness" was the Eskimo term. Other minor edits. As summer approached and the number of amusement park advertisements increased, it became obvious where his passions lay.